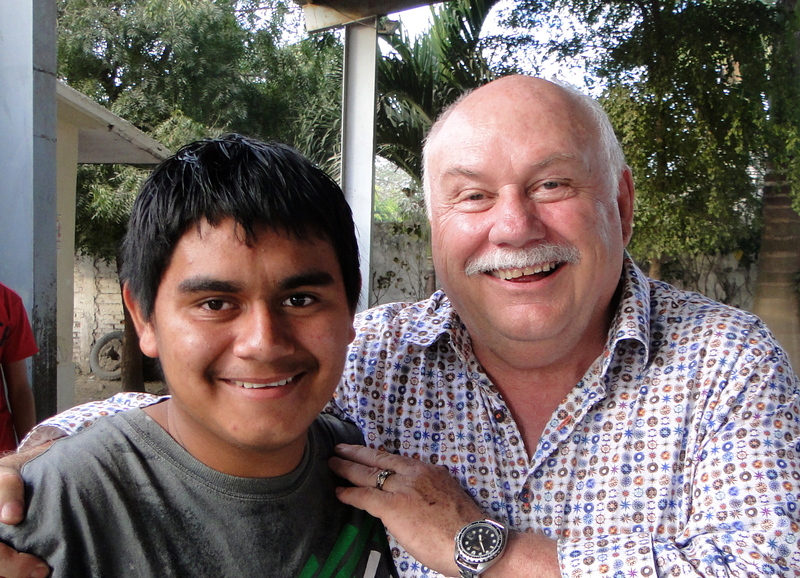 Dale Lyster (shown here with his sponsored student Aldo) and his wife Lynda, long time owners at Estrella del Mar, Condo 117, Phase 1 were former educators in Canada and they decided they would like to work with the schools in Barron. After their first tour of the elementary school in 2006, it was immediately obvious that they would need help with the language – neither the principal nor the teachers spoke English and the Lysters had no Spanish. The elementary school had about 100 books but they were stacked in a corner and are not accessible to the students.The junior high had maybe 50 library books and they were all in the principal’s office, inaccessible to the students. The kindergarten had a few books in each of the 3 classrooms. It was also obvious to the Lysters that the schools needed help. They were sad to see the poor condition of the tables, chairs and desks and the poor quality of the blackboards that had been painted with blackboard paint so often, you could no longer see the chalk. The buildings themselves were in need of renovations and the playground was a sea of mud on rainy days. The children and staff were friendly and interested in their visitors from Canada. The students, dressed in their navy pants and skirts with white shirts were ready to learn, but there were no books in the classroom, no art supplies and very limited resources. When asked about computers, the principal proudly showed them the 4 computers they had in a room the size of a closet. Three children sat on old metal benches in front of each computer, fascinated by what was happening on the screen and instructed by the computer teacher. There was no Internet – just a couple of computer programs on reading and writing. In another closet space were about 100 picture chapter books in Spanish. They were carefully stacked in boxes sitting on the floor. This was the school library – but there were no bookshelves for the books and the children were not allowed to use them as they had no way of tracking them. The Lysters were determined to help the children of Barron. On February 14, 2007 the elementary and secondary principals from Barron, Jorge Espinoza and Salvador Hermandes, a Barron community member, Jorge Rauld and three representatives from Estrella del Mar – Eduardo Quintero and Dale and Lynda Lyster attended a meeting at the Clubhouse at Estrella del Mar to discuss how they could help the children of Barron. Eduardo did the interpreting as the principals painted a picture of their schools and built a wish list of what they needed. Through the support of Pat Butler, the developer of Estrella del Mar, his administrative staff and the generous Americans and Canadians at Estrella del Mar, the Lysters started a fund raising program for the schools that continues on today. Education is never free. In Mexico, the State does support the schools but there are costs associated with attending school. First, the kids must buy uniforms (students need two school uniforms and one set of gym clothes) and school supplies(notebooks, paper, pencils, pens, back pack) . Then their families must pay the inscription fees. For Kindergarten and Elementary School, it is a nominal $100 pesos per year. Cost to go to the Secondary School (Junior High School) is $300 pesos per year, plus uniforms, plus books and plus supplies. There is no High School in Barron, so students must catch an early morning bus to Mazatlan to be there for 8am classes. The inscription fees for Prep School vary from $300 to $500 pesos per year. Some secondary school students from Barron do not go on to high school because of the cost. Bus money = $170.00 a month. Lunch money – $60.00 a month. The average wage for an EDM employee is about $110.00 pesos a day. Parents have to pay 100 pesos a year for maintenance of the school but many families do not pay. Mexican Government funds are provided to the schools but funding is not sufficient to meet all the needs. The government funds mainly pay for teacher salaries, utilities and some textbooks. Special requests can be made by principals for repairs to the roof or glass for the windows but there is no guarantee. 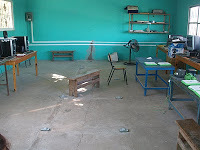 For example, the government put a computer and “Smart Board” into classrooms without technology support or training for the teachers. The elementary school has 4 Smart Boards and needs 3 more. The junior high has 1 Smart Board and needs 2 more.